Whole Farm Revenue Protection was required by the 2014 Farm Bill and developed by the USDA’s Risk Management Agency (RMA). WFRP will enable producers to insure their crops, livestock, and nursery and greenhouse crops for a revenue loss with a single policy rather than using individual crop policies. For many specialty crop and diversified producers, individual policies and price elections were not available. This both put producers at a risk management disadvantage but also made it more difficult for these producers to access the credit needed to start and grow their agricultural operation. In August 2015, the Risk Management Agency of the U.S. Department of Agriculture announced historic changes to Whole Farm Revenue Protection (WFRP), including expanded access to beginning farmers and nationwide availability. These changes will be effective starting in the 2016 crop year. 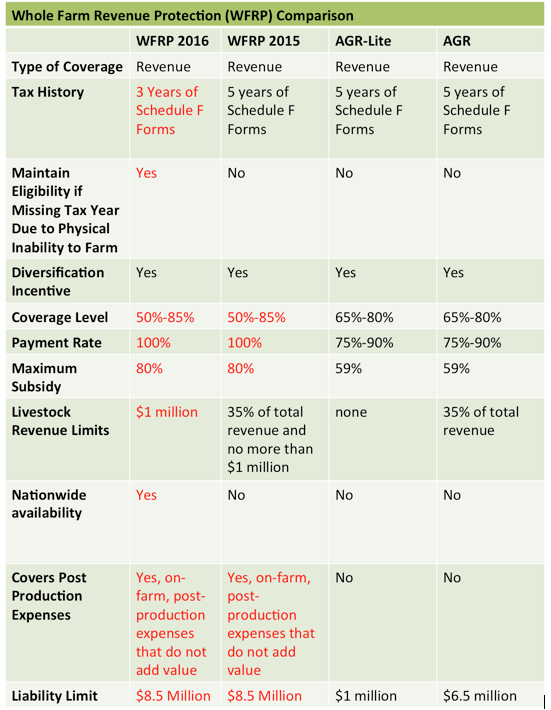 See how Whole Farm Revenue Protection compared to Adjusted Gross Revenue-Lite before the 2016 changes. Why Are the 2016 Changes So Important? The first iteration of WFRP expanded the availability and coverage options beyond what AGR and AGR-lite provided. Important changes however, were still needed to open access to beginning farmers and expand access to farms that incorporate livestock into the operation. The changes announced today address both of these needs. The comparative chart below has been updated to show how WFRP in 2016 compares to AGR and AGR-lite. As the chart indicates, WFRP provides unprecedented access to beginning farmers and livestock farmers. Farmers interested in signing up for WFRP will have the opportunity beginning September 1, 2015. Farmers will sign up through a local crop insurance agent, who can be found through the USDA. Farmers can begin reviewing further information about by reading the USDA fact sheet about WFRP. RMA has also released a premium calculator to aid producers’ risk management decision-making. You can also see a 60 minute presentation (about the 2015 version of the policy) featuring RAFI’s James Robinson partners at the National Center for Appropriate Technology (NCAT) and the National Sustainable Agriculture Coalition (NSAC). If you have any questions about WFRP, please contact Scott Marlow, Senior Policy Specialist. Email: smarlow@rafiusa.org. Tel: (919) 542-1396, x210.